What can be more soothing and comforting, in cold whether or when having a head cold, than a bowl of hot oatmeal. And the combination of crunchy, nubbly, creamy oatmeal is my favorite kind. That means using steel cut oats and a long slow cooking of 40 to 50 minutes. 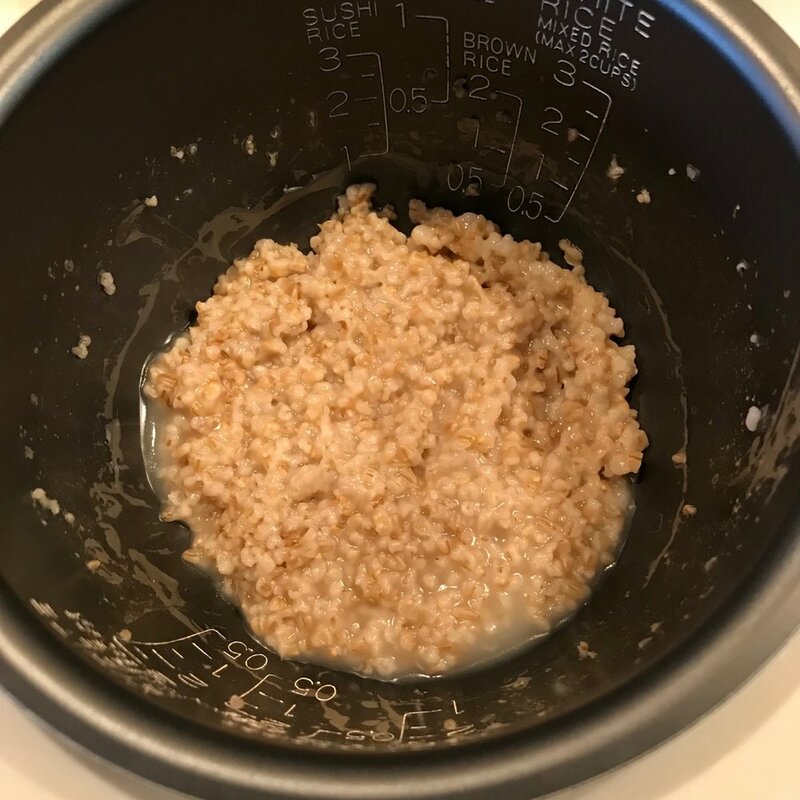 A double boiler works, stirring occasionally, but a rice cooker with porridge setting is ideal because the oatmeal doesn’t need stirring until the very end, it keeps it warm if you’re not ready, and doesn’t stick to the pot. If you have an electric rice cooker with a porridge setting, all you have to do is combine the water, oats, salt, and I like to add a little brown sugar, turn it on (mine plays Mary Had a Little Lamb to let me know the cooking has started and stopped!) and wait til you hear the finished signal. These cold days, I also like to add a little milk to a bowl and set it in my oven with the pilot light—if you have an electric oven and a very low setting that works too. That way milk cold from the frig doesn’t cool off the hot cereal. Alternatively you can heat the milk before adding it. To the rice cooker’s bowl, stir together the following: 2/3 cup/158 ml cold water, 1/8 teaspoon fine sea salt, 1/4 cup stone cut oatmeal such as McCann’s Irish Oatmeal, Optional: light brown Muscovado sugar. Press the cooking or start button and await for your rice cooker to tell you its time for hot oatmeal.